I've been that person on Ash Wednesday. Living life and running errands after work with a cross of ashes on my forehead as if I didn't realize it was there. And it's there for a reason. You can't wipe them off. Well, you're not suppose to. That's a big no no. 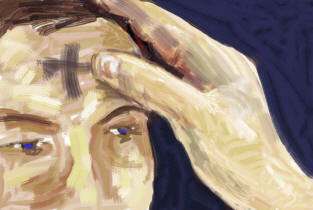 The ashes are in the sign of the cross and are a symbol of repentance. Today is the first day of Lent. Today is the day that I give something up for Lent. I am definitely going to need the Lord on my side beause not only am I giving up salt, but I've decided to give up sweets also. Giving up salt is one of the hardest things I do each year, but adding sweets to the mix? I'm really in for it. But Lent is a time of sacrafice. Jesus sacraficed his life for me. What can I sacrafice for him? Salt and sweets may seem trivial, but it really is a major sacrafice for me. Being Catholic and getting married in a Catholic church means that you have to go to confession before you take your vows. They won't marry you unless you do. Now I hadn't been to confession since I was 16 maybe, so I was totally freaked out at the thought. Priests are intimidating, especially when the priest is the priest who's marrying you and you've never met him before. Yes, I had to go to confession in St. Thomas. I woke up one morning and went down to the beach. My whole family was making fun of me and laughing at me for having to confess all of my sins later that day... in paradise. My cousin said that she wanted to go with and then joked that she'd be there all day because she has SO many sins to confess! She would be there all day, HA!! So, Bryan, Alicia and myself got all cleaned up and headed off to church. The second Alicia's feet stepped into the church, she totally chickened out! I wanted to chicken out too. They wouldn't marry us if I didn't. I walked into the little box and talked to the priest on the other side. I said "Forgive me Father for I have sinned and these are my sins. Ummm, I haven't done this in a while Father so I'd like to ask for your assistence. Would you walk me through this process?" He told me to kneel. We prayed a prayer that I had forgotten. And then we prayed a prayer that I knew. I walked out of my little box.... saw Bryan and Alicia sitting in a back pew whispering awkwardly like school kids in trouble. I chuckled to myself and walked out the church doors with them. I didn't confess a thing! How did I just get away with going to Confession without confessing an actual thing? I guess, if I dig real deep and stretch it as far as I can I can say that my confession was that I "haven't done this in a while." As much of an angel as I like to think I am... well, God knows as well as I do that that I have committed many sins since I was 16 and that I'm sorry for each and every one of them! Hi Kate, my name's Colleen. I'm a new follower, (just found your blog on Day in the Life! )and also a Catholic and a newlywed. I can't wait to catch up on your blog this evening! Take care! I loved this post!! I'm not Catholic...not sure what I would give up. I guess cheese. Salt and sweets? What is left? Vegetables? I was totally that girl with the ashes today too, and I am giving up the same things! Sweet and salty things! I'm not sure if I'm going to be able to do it, but I am really going to try! Funny story about confession. I want to go to that priest!